Foreword by Bruce Barnes. Text by Lisa Hostetler, William T. Green. The majority of photographic images today are recorded and viewed digitally, rather than on film and paper. Amateurs, photojournalists and commercial photographers alike rarely produce material objects as the final step in their photographic process, making photographs in the form of physical objects increasingly scarce. But what happens to personal and collective memories when photographic images are not instantly accessible on the face of physical objects? 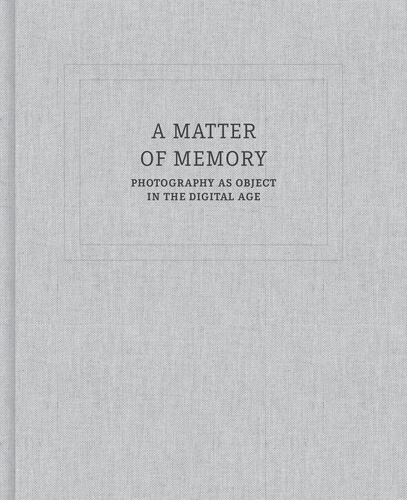 How is society’s relationship to memory changing as digital photographs become the norm? A number of contemporary artists are making work that suggests the potential consequences of photography’s latest metamorphosis. Two main strategies emerge: some artists dig deep into photographic materials as though searching for the locus of memory, and others incorporate found photographs into their work as virtual talismans of recollection. Both highlight the presence of the photographic object and function as self-conscious meditations on photography’s ongoing reorganization of our mental and physical landscape. A Matter of Memory features the work of more than 30 artists including Thomas Barrow, Matthew Brandt, Ellen Carey, John Chiara, Adam Fuss, Robert Heinecken, Leslie Hewitt, Kenneth Josephson, Laura Letinsky, Chris McCaw, Diane Meyer, Yola Monakhov Stockton, Vik Muniz, Floris Neusüss, Marlo Pascual, Matthew Porter, Taryn Simon, Michelle Stuart, Kunié Sugiura, Bertien van Manen, James Welling and Augusta Wood.